Another rainy day here. I decided that I actually had time to make a real breakfast. I usually just eat oatmeal with blueberries and protein powder at my office. 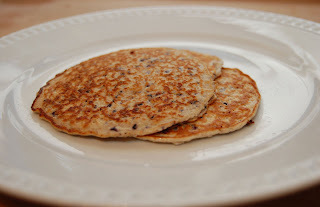 I decided to make Blueberry Protein Pancakes for Jason and myself. It's a super easy recipe, but I apparently need to practice flipping pancakes. Got a little messy here and there. Mix all ingredients in blender and voila, pancake batter. After breakfast, we made a soggy trip to Whole Foods for some last minute food items for tomorrow's meals. Then we went up to the gym for a noon spin class. It was short and sweet. It was done in a tabata style, and we also got off the bikes and did kettle bells. Intense, but the time flew by! Still raining...I was in my Christmas PJs by 3:30. 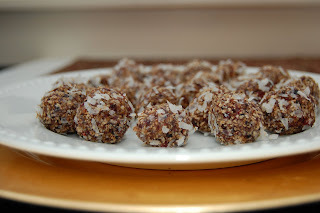 While hubby wrapped presents, I tried a new recipe: Cherry-Almond Bran Jingle Balls from The Healthy Apple. Place bran cereal, cherries and almonds in a food processor and process until finely chopped. Add honey, tofu and orange juice; pulse until a stiff dough forms. Scoop tablespoon-size portions and shape with greased hands into balls. Roll each ball in coconut and wheat germ. Place on wax paper. Let stand at room temperature for 30 minutes before serving or storing. I am normally not a fan of coconut (other than the Samoa Girl Scout Cookies of course), but the coconut is so subtle because of the fruit flavors. This recipe is a definite keeper!